To help provide children with the nutritional building blocks they will need to form healthy bodies and minds. To help supply key nutrients which research has shown play a role in promoting emotional well-being in children. To support the exceptional growth demands of childhood, when body weight doubles several times over and new cells are created at a phenomenal rate. To assist in the development and maturation of tissues and organ systems. To help meet the high energy demands and special metabolic needs of childhood. To aid in the maturation of the defence system, which in childhood is called upon to respond to some of its greatest challenges. To fill nutritional gaps that are the rule rather than the exception in children’s diets. Why GNLD children's chewable vita squares? Vita Squares provide optimal cellular nutrition that supports children’s physical and mental growth and development and emotional well-being. The formulation specifically addresses the nutritional needs of children. More than just a multivitamin. 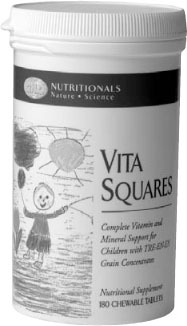 The most complete children’s supplement available, Vita Squares contain vitamins, minerals, lipids, sterols and other whole-food- based nutrients that are deficient in many diets but that are essential for optimal well-being. Contains Tre-en-en Grain Concentrates. Our exclusive formulation from whole wheat berries, rice bran and soybeans supplies lipids and sterols that are often processed out of the foods that make up children’s dietary staples. Broad-spectrum antioxidant protection from the entire vitamin E family of naturally occurring mixed tocopherols and tocotrienols, not just the most common member (alpha-tocopherol) or the synthetic form. 100% Naturally occurring sweeteners and flavourings. Sweetened with fruit juice concentrates (oranges, apples and grapes) and fructose and flavoured with berry essences. Contains no sucrose. Tastes great! Optimal mineral supplementation. Chromium has been added and Zinc included for its part in strengthening the body’s defence system. Concentrations of Copper have been increased while elevated levels of Iron help maintain healthy red blood cells, which play a role in oxygen transportation. The product also features Iodine shown to be an essential component of important hormones (thyroid). More choline and inositol. Choline and inositol have been shown to be important for cognitive functions (for example, learning and memory). Chewable tablets are easy to digest and absorb. More than just a multivitamin! Contains vitamins, minerals, lipids, sterols and other essential nutrients that are deficient in many diets. Tre-en-en Grain Concentrates from whole wheat berries, rice bran and soybeans. The entire vitamin E family, not just alpha-tocopherol. 100% Naturally occurring sweeteners and flavourings. Contains no sucrose. Choline and inositol to support cognitive functions such as learning and memory.